Oratorio gelding Divine Odyssey continued his ascent up the Stakes ladder with a bloodless victory in the Gr.2 Colorado King Stakes, his first at Graded Stakes level. 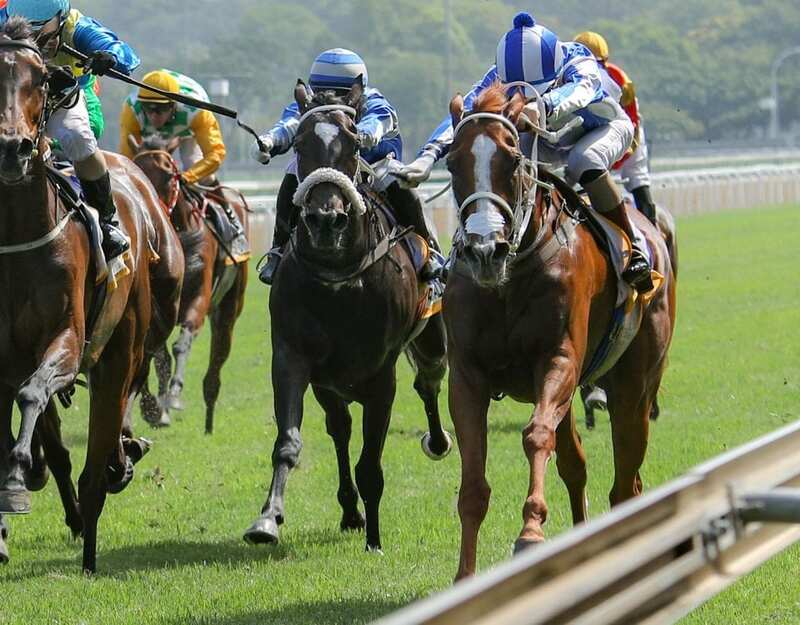 Fresh off his two-length win in last month’s Listed Drum Star Handicap, the four-year-old was always well-positioned and gathered a head of steam in the Turffontein straight to surge into the lead 300m out. He quickly put daylight between himself and the chasing pack and clinched the 2000m event by an impressive three-lengths. Divine Odyssey also continues his Avontuur-based sire’s purple patch of Graded Stakes winners over the past month, his success following those of Mardi Gras and Van Halen, respective winners of the Gr.2 Senor Santa Handicap and Gr.3 Man O War Sprint. Bred by co-owners Laurence and Jarryd Wernars, Divine Odyssey is out of Dynasty mare Divine Right, whilst grandam Raise The Roof (National Assembly) is a daughter of former Broodmare of the Year On The Roof. From the immediate family of Blushing Groom, the Thatching mare proved a veritable goldmine at stud as the dam of six Stakes performers from seven foals, amongst which the Gr.1 SA Derby/Classic and Daily News 2000 hero Badger’s Drift, multiple Gr.1-placed Gr.2 winners Secret Hoard and Dancing In The Rain and the Gr.2-placed Stakes winners On The Tiles and Arcade. 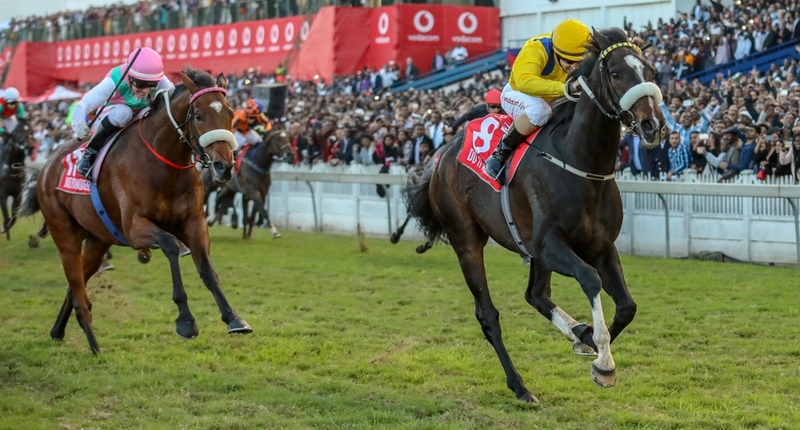 Stalwart owner Mary Liley’s iconic vieux rose, cream and green silks made a welcome and long overdue return to the Stakes limelight when her three-year-old Tristful landed the 1400m Gr.3 Byerley Turk at Greyville. 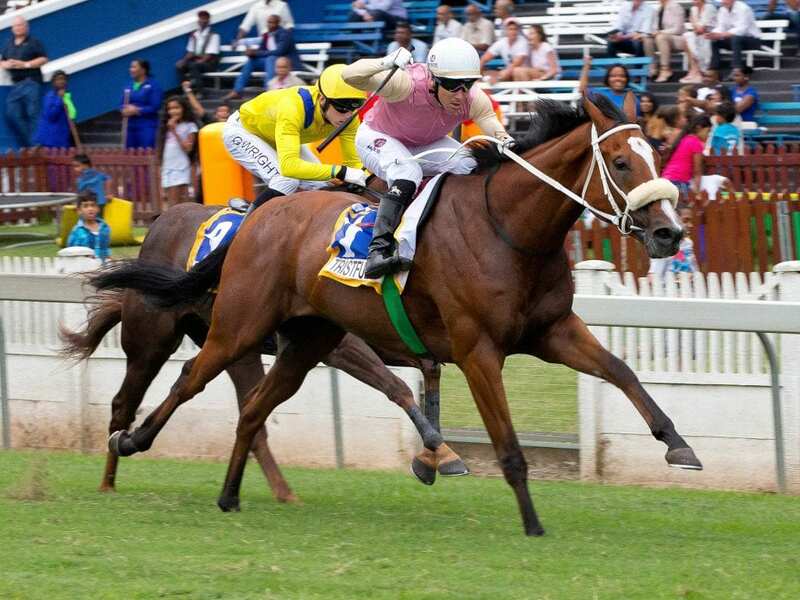 Biding his time early on, the gelded son of Trippi wore down long-time leader Solid Gold (Rock Of Gibraltar) to take command in the closing stages for a length score. This was a third success in just five starts for the winner, who is clearly on an upward trajectory and could have Gr.1 aspirations, according to his excited connections! Purchased for R250,000 at the Cape Premier Yearling Sale, Tristful is a product of the Gary Player Stud and is the first foal of Jet Master mare Hear The Rain, a winning half-sister to Gr.2 Debutante victress Winterinthewoods (Western Winter). Grandam Niteinthewoods (Fort Wood) is one of eight winners out of the Jubilee Handicap victress Thousand Nights (Foveros), whose exploits as a broodmare surpassed her excellent racetrack achievements. To Badger Land she produced dual Gr.1 Gold Cup hero Highland Night and Gr.1-placed Stakes winner Night Watch, a liaison with Western Winter resulted in the dual Gr.1 winning sprinter and sire Warm White Night, whilst Al Mufti features as the sire of her Gr.2 Derby winning son Prince Asad. Her Gr.1-placed daughter Vogue (Model Man) is the dam of Gr.2/3 winner Fort Vogue (Fort Wood), Gr.3 victress Whatalady (Jet Master) and recent Gr.2 Senor Santa runner-up Prince Kahal (Kahal). The Gr.3 Umzimkhulu Stakes featured a one-two for Duke Of Marmalade, with the Chrigor Stud-owned Temple Grafin leading home her paternal half-sister Santa Clara. Under Anton Marcus, tThe chesnut unleashed a powerful rally up the stand side to join Santa Clara and pacesetter Silvano’s Pride (Silvano) close home, before asserting her authority by a half length. This was a second Graded success for Glen Kotzen’s charge, who was also her sire’s first South African-bred Stakes winner with victory in the Gr.2 Debutante as a juvenile. Duke Of Marmalade, who relocated from Coolmore to Drakenstein Stud in 2014, has made a smart start to his local stud career, with both the winner and runner-up hailing from his first local crop, as do the Listed Jamaica Handicap winner Princess Irene and recent Gr.2 SA Oaks third Seville Orange. Significantly, all are fillies! The blue chip stallion has a sizeable draft of 19 catalogued for this month’s National Yearling Sale. A R300,000 Cape Premier Yearling Sale graduate, Temple Grafin is the second foal of Inner Temple, whose half-brother Roman Wall (Count Dubois) won the Listed Easter Handicap. Grandam Chica (Fort Wood) is a winning full sister to the champion and SA Oaks victress Monyela, Gr.2 Emerald Cup hero Iron Curtain and to the dams of Gr.3 Cape Classic winner Eighth Wonder (Captain Al) and Port Elizabeth Gold Cup victor Shady World (Ideal World). The next dam West Wall (Plugged Nickle), a half-sister to Horse of the Year Horse Chestnut, won the Gr.3 Strelitzia Stakes. 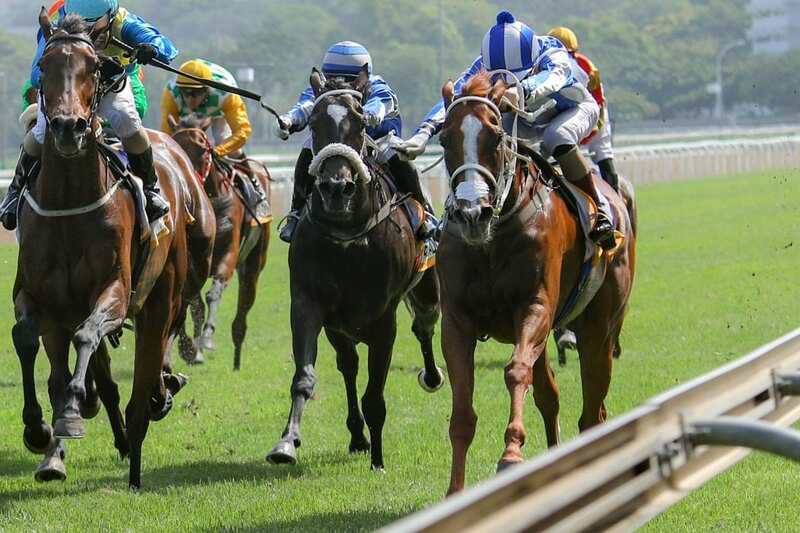 Twenty-two entries have been received for the Gr.1 Premiers Champion Challenge, the marquee event at the Turffontein meeting on 4 May. The 2000m race has attracted a formidable quintet from the Mike de Kock stable, headed by Sheikh Hamdan’s star three-year-olds Hawwaam (Silvano), Soqrat (Epaulette) and Barahin (Gimmethegreenlight). Hawwaam led home Barahin in the Gr.1 SA Classic, but missed the Gr.1 SA Derby after he got a fright and bolted from the parade ring, whilst Soqrat defeated a star-studded field in the Gr.1 H F Oppenheimer Horse Chestnut Stakes. The quintet is rounded out by High Chaparral’s Gr.2 winning daughter Cascapedia and Gr.1-placed Noble Secret (Dynasty). Earlier this week, assistant trainer Mathew de Kock commented: “Hawwaam is being pointed at the Champions Challenge and then we’ll make a decision on his next race, which could possibly be the Daily News. We’ll be entering him for the Durban July, but he is not certain to run there. Sean Tarry has entered the venerable Legal Eagle (Greys Inn), Gr.1 Summer Cup hero Tilbury Fort (Horse Chestnut), recent SA Oaks victress Return Flight (Pomodoro) and SA Derby second Zillzaal (Silvano). Also amongst the entries is a rare Cape-based challenger, Gr.3 winner Made To Conquer. 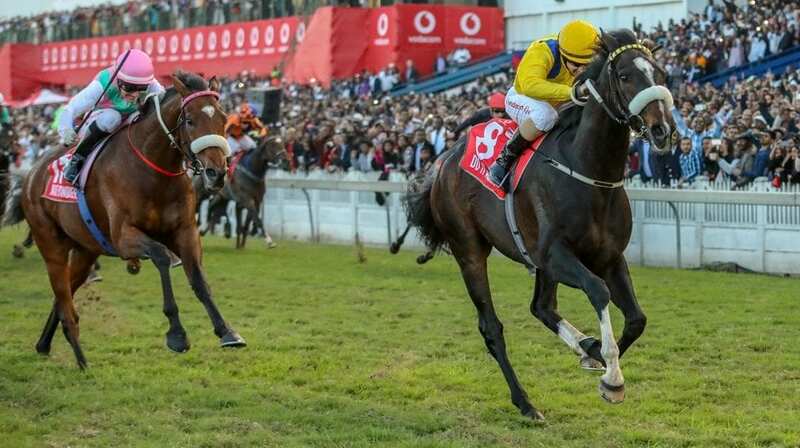 Trained by Justin Snaith, the Dynasty five-year-old was runner-up in last season’s Gr.1 Durban July.